Formation : Double circle, men with their backs to the centre facing their partners. 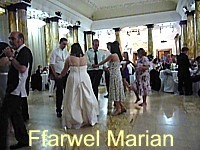 Music : Any 32 bar waltz, or set music. A1 With both hands joined, partners slide four steps to the man’s left [counter-clockwise]; balance to partners and turn away from them. A2 That again in the same direction. B1 Right hand to partner; forward and back and change places; left hand to neighbour’s partner; forward and back and change places. B2 Waltz: all waltz round the set with new partners.